Thank you to Penguin Random House (Canada) for drawing my attention to this beautiful and haunting memoir. It was something they were offering to read, and it was something that I knew I would want to read, for certain. And now that I have had the privilege (really) to have read it, it will be something that I want to return to again and again, and it will be something that I want to press into everyone’s hands. It’s an important read, and it’s something that will change you. Loridan-Ivens is now 87 years old but the loss of her father, the horrors of the concentration camps and the struggle at being happy to be alive has never ever left her. “I don’t belong here anymore.” (page 1.) She also writes about the rise of anti-Semitism, she writes this memoir in full-stop, with a little-to-no breaks manner that is exquisitely beautiful as it is haunting and heartbreaking. I will re-read this I’m most positive of that. But, most chilling, is the final page. 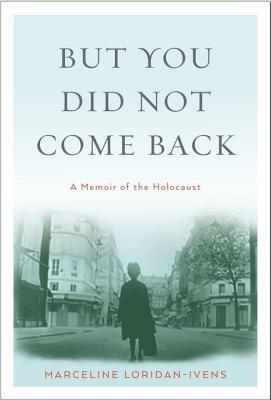 The page where she asks her sister-in-law, another Holocaust survivor, “Now that we are approaching the end of our lives, do you think it was a good thing for us to have come back from the camps?” “No, I don’t,” she replied, “we shouldn’t have come back. But what do you think?” (page 100.) Loridan-Ivens response is that she thinks like Marie, that no, no she doesn’t think they should have come back. So strong is her life-long unhappiness and bereft loss of her father, that no, she wishes she had died in the camps. The Economist has written this stunning article about But You Did Not Come Back and it, and now hearing from others that have started to read this memoir, I’ve marked this as a 5-star read. It haunts me.